One of the major draws of consumer drones is their ability to capture your most exciting adventures from the most epic angles possible. And while collision detection and automatic-follow technology are perfectly satisfactory in most situations, even advanced drones meet their kryptonite in the form of H20. Of course, nature abhors a vacuum, and SwellPro has created the Spry to fill it. 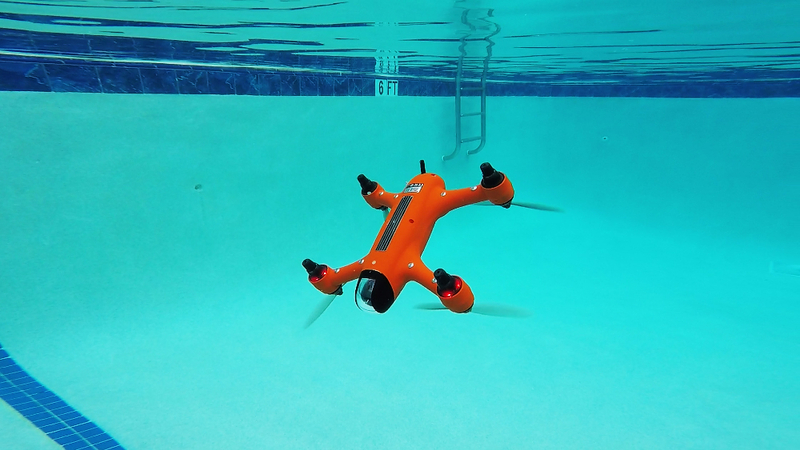 After releasing a series of models that could land on top of the water and capture video under the surface using a waterproof camera suspended from its undercarriage, the Chinese manufacturer has taken its technology to the next level with the Spry, which doesn’t only land on water but is also fully waterproof, meaning it can be fully submerged for brief periods without damaging the drone. This gives watersports junkies the chance to record their best runs without fear of their expensive new drone taking a header into the drink. Of course, we’ll reserve judgement until we see it for ourselves, but the company’s claims are impressive. Based on racing quadcopter design, the drone can fly faster than 70 km/h, meaning it can keep up with the action. It is equipped with a built-in camera that can capture 12 megapixel still images and 4K video at 30 frames per second (60 would have been nice, but we’ll take it). The Spry is operated via an accompanying waterproof controller with a screen that streams live video from the drone’s camera. In GPS mode, you can use features like return to home, follow mode and orbit mode, although turning it off gives the pilot full control of the drone — letting it reach its top speed and perform acrobatic maneoeuvres like flips. The SwellPro Spry is available through independent Australian retailers, with prices ranging from $2100 to $2600, depending on accessories.